Korouoma is a 30-km-long fracture valley running from northwest to southeast on the border of the municipalities of Posio and Ranua. It is part of a fracture zone in the bedrock, which is hundreds of millions of years old. The entire zone stretches from the town of Rovaniemi and follows the Kemijoki River Valley to Autti and Auttiköngäs Falls and through Korouoma to Kuusamo. At the centre of Korouoma the fracture valley forms a gorge which has worn down and become much deeper than the surrounding terrain. The walls of the gorge are cliff faces which are tens of metres high and extremely steep. Small streams which cascade down the cliff faces freeze into icy water falls during winter. They stay frozen till late spring. The River Korojoki meanders and twists at the bottom of the canyon flowing towards the northwest. Its banks are lined by lush flood meadows and herb-rich forests. The vegetation in the northern part of the valley is lusher than in other parts of the valley indicating that the soil is calcareous. On the other hand moderately dry and dry pine mineral soil forests are the typical vegetation type in the Lapiosalmi area. The terrain around the valley is varied, marked by hilly terrain and covered with old-growth forest. Between hills there are aapa bogs and spruce-covered hanging bogs characteristic of Northern Ostrobothnia. Most of the bird species in Korouoma are those that typically inhabit the forest. An official count found that there are 62 species in the area, but this does not include, for example, some of the local water birds and those species that appear in small numbers. 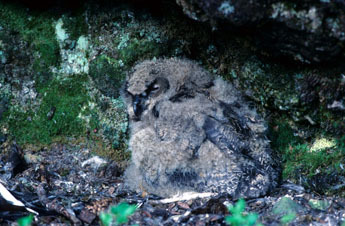 The rarest bird of prey to nest in the area is the Northern Eagle Owl (Bubo bubo). Some have also made sightings of nests inhabited by the Rough-legged Buzzard (Buteo lagopus). The unique feature of the area is the Northern House Martin (Delichon urbica), which nests on the area's cliffs. It is also possible to see the Golden Eagle (Aquila chrysaetos) at Korouoma. The vegetation in Korouoma offers the ideal nutrition for the moose (Alces alces), which even spends winter in some parts of this area. There are three near threatened mammal species in Korouoma. There have been sightings of the lynx (Lynx lynx) and the otter (Lutra lutra) is known to live near the River Korojoki. The bear (Ursus arctos) is sighted regularly in the area. The fish which naturally inhabit Korouoma waters are the trout (Salmo trutta), the brown trout (Salmo trutta fario), the grayling (Thymallus thymallus), the whitefish (Goregonus lavaretus), the pike (Esox lucius), the perch (Perca fluviatilis), the burbot (Lota lota), the roach (Rutilus rutilus) and the ruffe (Gymnocephalus cernuus). In addition some fish species have also been planted in the recreational fishing waters. These include rainbow trout (Oncorhynchus mykiss), trout (Salmo trutta), lake trout (Salvelinus namaycush), grayling (Thymallus thymallus) and whitefish (Goregonus lavaretus). A study in the area found that there were two threatened and 9 near-threatened beetle species there; examples of these being the Eucilodes caucasicus and the Upis ceramboides. There are 7 butterfly species two of which are the Moorland Clouded Yellow (Colias palaeno) and the Pearl-bordered fritillary (Clossiana euphrosyne). The number of species found seems quite small and some species which have in previous years been abundant in southern and central Lapland were not found at all. The canyon's climate differs noticeably from the surrounding area's climate. This means the vegetation differs as well. On its northeastern slopes, which are sunnier and warmer, and in brook hollows there are lush herb-rich forests with southern plant species; such as the Male Fern (Dryopteris filis-mas) and Fragrant Bedstraw (Galium triflorum). The slopes at the south and southwest end of the valley have a cooler climate. Snow stays on shady cliffs and in hollows far into the spring. The plant species on cliffs are those of the north; such as Rock Whitlowgrass (Draba norvegica), Alpine Saxifrage (Saxifraga nivalis) and Alpine Cliff Fern (Woodsia alpina). Exotic eastern species are represented by Diplazium sibiricum and European Baneberry (Actaea erythrocarpa), which grows mainly in the northern part of the valley. An inventory of the species of aphyllophorales found in the Korouoma-Jäniskaira area has been done in connection with an inventory of old-growth forests. There are 21 species of aphyllophorales which are classified as threatened. Altogether 78 species of shelf fungi were found in the area. For the most part the forests in Korouoma are dry pine heaths. Extensive felling of the area's pines and removal of fallen trees has caused a decline in the shelf fungi species found there. The study found only one specimen of Amyloporia crassa in Korouoma in 2001, which seemed peculiar in respect to the abundance of pine forest in the area. Also Gloeophyllum protractum, Antrodia infirma, Postia hibernica, Anomoporia myceliosa and Postia lateritia appear in the area more rarely than expected. Species found in small fallen decaying pines and debris of fallen branches, such as Amyloporia xantha, Antrodia sinuosa, Antrodia albobrunnea, Skeletocutis lenis and Byssocorticium terrestris are common in the area. Korouoma is a 30-km-long fracture valley running from northwest to southeast on the border of the municipalities of Posio and Ranua. It is part of a fracture zone which is hundreds of millions of years old. The entire zone stretches from Rovaniemi and follows the Kemijoki River Valley to Autti and Auttiköngäs Falls and through Korouoma to Kuusamo. Near Kuusamo the fracture zone is broken up into several fracture valleys, which are visible to us as long river valleys and lakes, such as Lake Livojärvi. In the northwest the fracture valleys reach all the way up to Kolari. In the centre of Korouoma the fracture valley forms a canyon that has worn its way into the surrounding terrain. At its deepest the gorge is approximately 100-130 metres deep. Its cliff walls are tens of metres high and extremely steep and at points vertical. The bottom of this canyon is level and it is 200 to 500 metres wide. Parts of the canyon have become boggy and the narrow twisting River Korojoki meanders through it. The bedrock in Korouoma is mostly made-up of coarse red granite, which tends to split and crack. The walls are uneven and covered by cracking boulders. There are many spots in the granite that are composed of gneissose granite. Better preserved sedimentary rocks such as mica schist and quartzite can be found in the southeast of the area.